Our Pink Mini Photo Tote has a 3"x 3" clear pocket on each side, which can hold pictures of family, insert your business logo or business card, for display on the outside for everyone to see. Insert & exchange your own pictures as you wish. 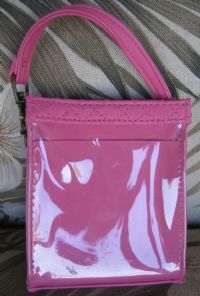 The Mini Photo Tote has a velcro closure and a snap clip handle, which allows you to attach it to your purse or belt loop. MINI TOTE DIMENSIONS: 3 1/2" x 4 1/4"